Flemington Racecourse is one of the oldest and most beautiful racetracks in the world and home to Australia's most famous horse race, the Melbourne Cup. Flemington Racecourse is located on a flood plain of the Maribyrnong River, just a few kilometres from the Melbourne city centre, has been used for horse racing every year without interruption since 1840. This was just five years after the first settlement of Melbourne, and it makes Flemington one of the oldest racecourses in the world outside England: older, for example, than Longchamp in Paris and America's Churchill Downs where they run the Kentucky Derby. In Melbourne Cup week 2006 the Australian Government placed Flemington Racecourse on its National Heritage List, identifying its "importance in the cultural history of Australia because of its development into one of Australia's premier racecourses". It mentions the importance of the Melbourne Cup as "the race that stops the Nation" and as a stimulus for the arts and fashion. The Victoria Racing Club looks after the racecourse which now accommodates extensive training stables with hundreds of horses in residence. The grandstands and associated buildings are busy around the year as a popular events centre. Up to twenty times a year the course comes alive for race meetings. Outside the spring season, the biggest meeting is now called Super Saturday, held in the autumn with a program of races including the historic Newmarket Handicap and Australian Cup. The Melbourne Cup Carnival is the highlight of the sporting calendar for Victorians, Australians and many overseas racing fans. 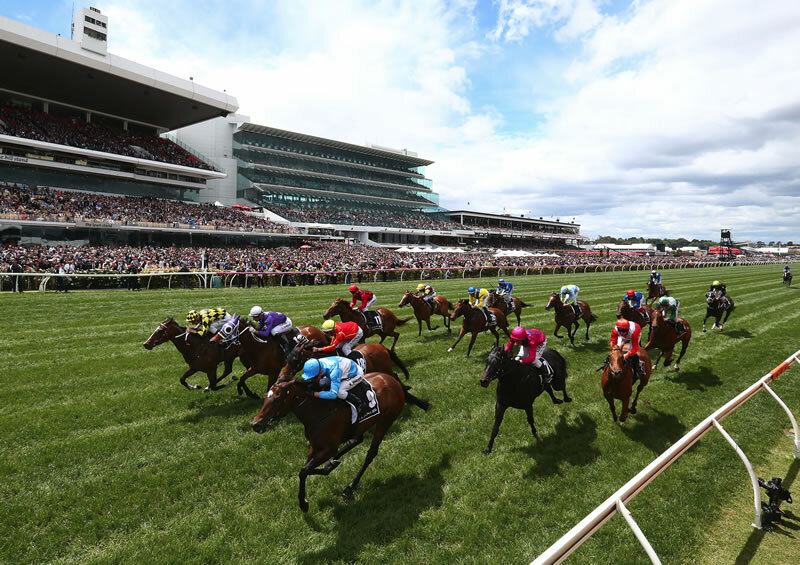 The Melbourne Cup Carnival encompasses the famous Lexus Melbourne Cup Day (held on the first Tuesday in November) along with three other key racedays: AAMI Victoria Derby Day, Kennedy Oaks Day and Lexus Stakes Day. Flemington is also renowned for its fabulous roses which line the mounting enclosure and are in full bloom during the carnival. Flemington is located 6km north-west of the CBD. Please be aware during Melbourne Cup Carnival: You may experience heavy traffic conditions travelling by car to Flemington via the CBD so please take this into account when planning your journey. Delays in Ascot Vale Road at the railway gates can also be expected due to increased train frequency. Trains will depart from Flinders Street Station (platform 8, 9 or 10) between 8.17am - 1.18pm, express to Flemington Racecourse. Trains will run approximately every 10 - 15 minutes. Trains will depart from Southern Cross Station (platform 8) between 8.20am - 1.23pm, stopping only at North Melbourne Station (platform 2). Trains will run approximately every 10 - 15 minutes. Trains will depart from Flinders Street Station (platform 8, 9 or 10) between 1.25pm - 5pm, stopping only at Southern Cross Station (platform 14) and North Melbourne Station (platform 6). Trains will run approximately every 10 minutes. Trains will depart Flemington Racecourse (platform 1 or 2) between 1.36am - 9.16pm, stopping only at North Melbourne Station (platform 5), Southern Cross Station (platform 13) and Flinders Street Station (platform 8 or 9). Trains will run approximately every 10 minutes. Taxis, limousines and hire cars are not permitted entry to the racecourse at Members Drive or Flemington Drive. The main taxi ranks are situated in the main car park (adjacent to the main entry turnstiles), Riverbank Rank, Hill Gate Rank (adjacent to Hill Gate entry point). There are 3 designated UberZONES for easy drop-offs and pick-ups. They can be found at the Hill Gate, Elms Gate and the Main Gate. Check your Uber app on the day to find the best zone for you. Flights depart from Melbourne and land at the helipad/passenger area, at Flemington Racecourse. VIP Lexus courtesy vehicles will then transfer from helipad to main entrance. For more information, contact Melbourne Cup Helicopters on 1300 724 927. Ferry services for exclusive groups operate from the city centre to Flemington along the Maribyrnong River. For all information, contact City River Cruises on (03) 9650 2214. Undercover parking is available at Marvel Stadium on all four days of the Melbourne Cup Carnival. Racegoers can then walk to Southern Cross Station to catch a train to Flemington. The SkyBus express service operates between the city centre and Melbourne Airport (Tullamarine). They operate 24/7 including all public holidays. SkyBus offers a Hotel Transfer Service from their Southern Cross station city terminal to your hotel, using their fleet of mini buses. A taxi from Melbourne Airport (Tullamarine) to Flemington will cost approximately $35-$40.